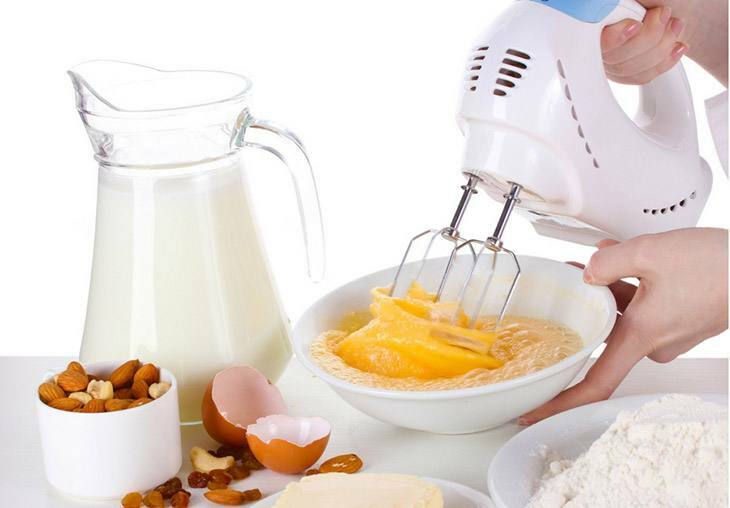 →How To Find The Best Hand Mixer For Your Kitchen? How To Find The Best Hand Mixer For Your Kitchen? The Best Hand Mixer is one of the kitchen appliances you are probably missing in your kitchen. It is a hand powered, battery operated or electronic device that you can use to stir, beat and whisk foods during preparation. Electric Hand Mixer is a more sophisticated version a hand powered Mixer but with a small motor located in the top section with a handle. Unlike in the hand powered Mixers where you need to crank a handle, it is the motor in electronic hand mixers that moves the beaters. What Are The Advantages Of A Good Hand Mixer? What Are The Disadvantages Of A Hand Mixer? How To Find The Best Hand Mixer? How Much Does A Hand Mixer Cost? How To Use A Hand Mixer Effectively? There are several benefits of a good hand mixer which you are not getting if you don’t own one. It allows you to create different baked foods you have always craved for in your kitchen. 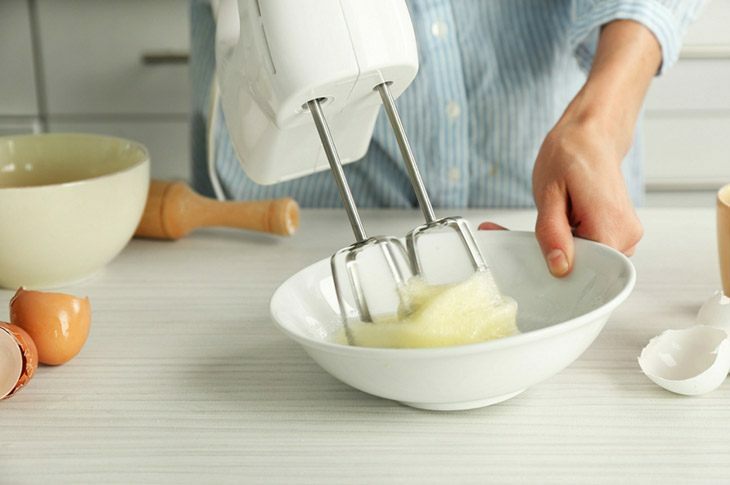 The Best Hand Mixer works by effectively mixing all the ingredients for you. Cookies, pies, cakes and even doughs for bread, pizzas and biscuits can be easily and quickly be prepared when you are armed with this kitchen essential. The second advantage that you get is related to cost. If you own the Best Hand Mixer, it will carry out the same kitchen assignment as stand mixers do. So there is no need to invest a lot of money buying a ﻿﻿S﻿tand Mix﻿﻿e﻿﻿r if you are planning to purchase a M﻿ixer for home use. Other advantages you receive include, takes up minimal space in your kitchen, quick and easy cleanup, and ideal for carrying out quick tasks such as whipping egg whites or cream. You can also use your hand mixer with your preferred bowl because the beaters are not fixed on a certain mixing bowl. Hand mixers have some disadvantages when you compare them with stand Mixers. One of the drawbacks is that you will be involved in running the device. Therefore, the Best Hand Mixer might not be a good choice for you if you don’t love using your hands in baking. Another disadvantage of Hand Mixers over stand mixers is that they come with smaller motors so their mixing capabilities are compromised. Also, because bowls will not be located in a fixed position, chances of getting splashed while mixing are very high if you don’t have a strong hand. Last but not least, I find it difficult to maneuver when using a hand Mixer particularly when the batter is very thick. 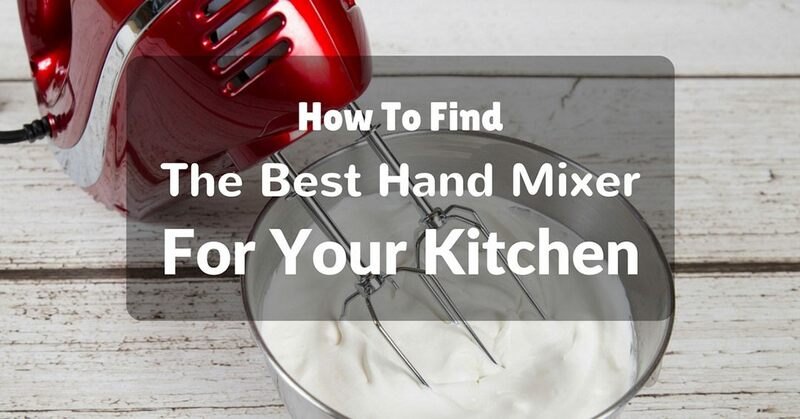 In the remaining sections, I’m going to give you detailed information that will help you find the Best Hand Mixer without any hassle. You will simply use the information to select the best product for your kitchen. I will start with some of the factors to consider when purchasing the Best Hand Mixer and then proceed to recommend the popular choices on the market. If you plan to carry out regular baking, then it is a good idea to choose an appliance that can withstand that amount of work. A hand mixer with a sturdy motor will provide you with the power you will need to carry out your baking duties. Just keep in mind that some baked foods needs a whipping action. This action ensures that all unwanted bubbles are expelled from the batter. Some baked goods require bubbles so that they can light and rise during the baking process. A hand Mixer with different speed variables will help you achieve all this. You also need to factor in the type of hand mixer you want to purchase. You can go for a hand powered mixer as they allow you to bake anywhere even in neighborhoods that don’t have a reliable source of electricity. You can also chose electric or battery powered ones as they are easier to use than hand powered ones. Size is also an important factor to consider when choosing a hand Mixer. If you want a hand Mixer that creates faster mixes, it is recommended you go for one with a large beater. Hand Mixers with smaller beaters might be a good option since they create denser results easily. 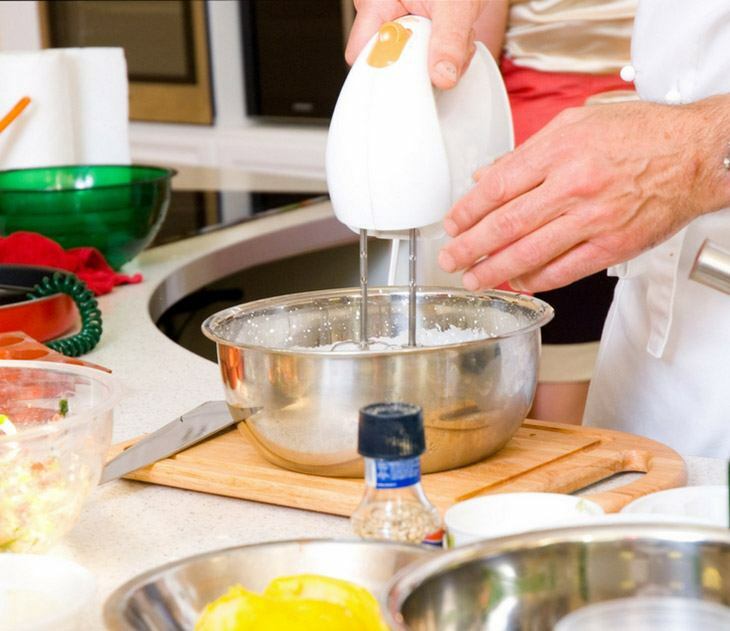 These are the main factors you need to consider during your shopping spree to make sure you are getting the Best Hand Mixer for your needs. This is another widely asked question. The general agreement among cooking enthusiast is that a good hand mixer will cost between $50 and $100. However, you can spend less but still find a capable and durable hand Mixer. Hand mixers with prices that are below $50 mark will still give the best results but with basic features. If you want a device with advanced features you have no option than spend more. The video below will help you understand how to use a hand mixer effectively. I’m finally ready to take you through my popular choices for hand in 2017. There are dozens of them on Amazon. I have only featured the top five based on their number of reviews and overall rating at Amazon. Read on to learn more. This is a 9 speed hand Mixer from KitchenAid. I’m lucky that I own this Mixer because it giving me a lot than what I expected. It comes with a wide range of attachments, variable speed control and clever features such as a cotton bag with a cord tidy strap and internal accessory pockets. This features eases storage and prevents unwanted flex from interfering when I’m carrying out my cooking duties. Another primary feature that I also like most about this hand Mixer is the soft start feature. This feature does not wreck the integrity of my recipes throughout the cooking process. From a press of a finder on the digital display, you can switch from the slow and low soft start to a high and fast whip. The device comes with a strong motor that provides plenty of power which I normally use to knead bread dough without any hassle. This Handle Mixer also features a plastic body with a glossy finish. This material keeps the overall weight of this hand mixer down. So you won’t find any problem moving it to a different location within your kitchen. It comes with a soft-grip handle which you can use comfortably without having to stretch your hand. Variable speed for controlled mixing. Multiple attachments with storage bag. Handles heavy mixtures with ease. Powerful motors for heavy mixing tasks. There are no ideas about recipes. Motor heats up after prolonged use. I came across Cuisinart HM-90S when I visited my sister a few months ago. She asked me help her in the kitchen and it here I first set my eyes on this handheld Mixer. I used the Mixer to make dough which we used to bake bread. It helped us to accomplish the task quickly since it was late at night. In the morning, I took my time to find out more about this hand Mixer since it out performed the one I own. Just like the one I own, Cuisinart HM-90S is equipped with 9 speed options. This model won’t give you the power of a 10 speed model but you will get plenty of power to work through almost any batter or dough without any hassle. It comes with a slide control mechanism so controlling its speed is really simple. It features a slim and compact design. It is extremely easy to store in your kitchen and move around. My sister says that it has never been a cause of eyesore in her kitchen. A slow-start function that prevents splattering. The Mixer is not heavy to make you tiresome or large enough to feel consume your kitchen space. Always been famous for its durability. Very sleek and attractive design. Dishwasher safe parts making cleaning a total breeze. Not ideal for heavy duty restaurant tasks. 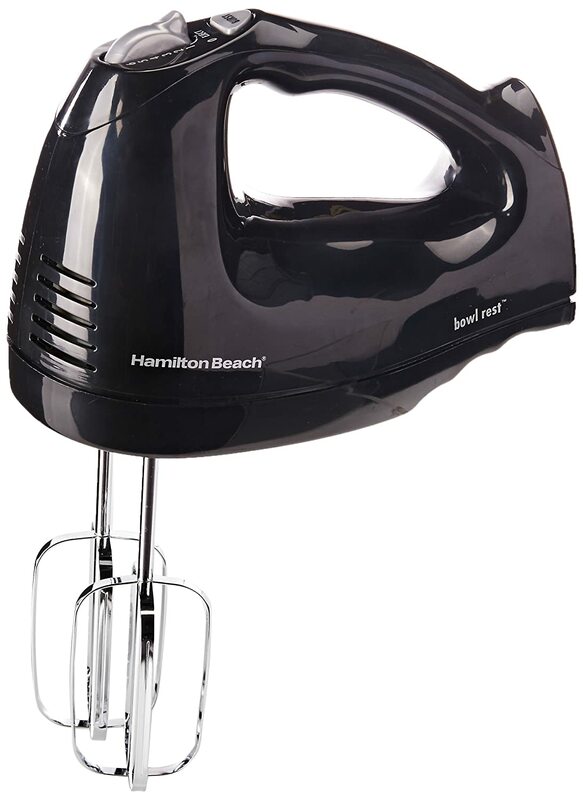 Another hand Mixer that you can consider purchasing is the Hamilton Beach Hand Mixer. This black colored handheld mixer provides an excellent grip that guarantee comfortable and secure support while mixing. With a peak power of 290 W, this hand Mixer makes the entire process of dough or batter making easy and fast. Another appealing feature of this handheld mixer is the brushed stainless steel finish which is meant to protect it from rusting. It also features a snap-on storage case so you won’t be worried about losing your beaters. It weighs just 4.2 pounds so you don’t need to worry about storage or movement. This model from Hamilton Beach also offers 6 different speeds which can help you end up with any type of baked good that you want. In addition, it is equipped with a QuickBurst button which charges up the mixing process. Other valuable features include equipments like traditional beaters, dough beaters, wire beaters and whisks. No messy splatters because of gradual decrease in speed. Snap-on case for storing equipment. Comes with a Bowl Rest which prevent the batter from dropping on your platform. Equipped with a QuickBurst button which boots the speed of the unit further. Beaters do not reach the bottom of the bowl. Not for heavy-duty work or multi-taskers. The KitchenAid KHM512IC is a 5 speed hand Mixer to consider for nearly all your mixing needs. It is equipped with stainless steel turbo beaters which provide you with plenty of power you need to mix up your dough, batter, mash potatoes and much more. Its mot﻿﻿o﻿﻿﻿﻿r is lightweight but powerful enough to handle a variety of tasks. The Hand Mixer also features easy-slide speed controls for mixing and beating any type of batter or dough, a comfort-designed handle for firmly holding the mixer during the mixing process and a lockable swivel cord. I highly recommend this hand mixer if you are planning to use it for household jobs. Comes with a large storage bag that keeps the Mixer and accompanying attachments protected. Equipped with a powerful motor which doesn’t produce smell when heated up. The slow start feature which prevents splattering while using the device. So many speed buttons which can be confusing if you are a starter. This hand mixer has an illuminating headlight. It can be used to mix cream cheese frosting, whipped cream, chocolate brownies, and fluffy meringue. They all need a mixing that is precise. The light will guide you as you mix. It has digital controls that will help you to decrease or decrease the mixing speed. The motor is powerful and consistent. It helps to maintain the speed. This illuminating hand mixer will give you the desired results. After mixing, you can wrap and secure the cord flat using the on-board beater clip. This makes it compact and easier to store. This digital hand mixer will make your baking work easier. The motor is powerful to maintain the speed. The headlight will illuminate the bowl as you mix. You can be able to monitor the consistency of the batter easily. The light remains on as long as the mixer is plugged in. The digital hand mixer has a set of dough hooks to help you get an extra thick batter. It has digital controls to help you adjust the speed easily. It is easier to store this mixer. The cord wraps around the base to make it compact. The gift-wrap is available. The package is easier and simple to open. It may stop working after few uses. Warranty is not applicable outside USA. The mixer is compatible with 110V outlets only. You cannot use it with a transformer. Among the Hand Mixers that I have reviewed above, Cuisinart HM 90-S mixer is my clear winner. I regard it as my favorite choice since I don’t love the luxury of a Stand Mixer. With its 9-Speed settings, you can carry out any mixing task at hand from fluffy meringues and icings to simple cookie batters.